Happy Halloween from Chicago’s Past! Quiz: Do You Know Chicago’s Parks? 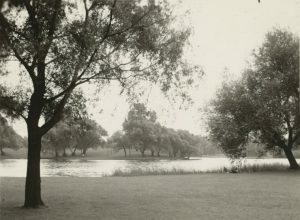 Washington Park Lagoon, 1935. Source: Chicago Park District Records: Photographs, Special Collections, Image 104_005_014. Congratulations, Chicago, you've made it to summer! If you're reading this, though, you're probably stuck inside wishing you were enjoying one of Chicago's amazing parks instead. Now you can experience the parks virtually. We're proud to announce our Chicago Park District Photograph Digital Collection. Explore 10,000 images from parks all over the city and from throughout history. Want even more? Come to Special Collections to view over 50,000 more images and over 100,000 architectural and landscape drawings. And in the meantime, test your knowledge of Chicago Parks history by taking our quiz. Chicago’s boulevard system was developed alongside its parks to connect major parks with a “ribbon of green.” Garfield Boulevard passes through which parks? The City department that eventually became the Chicago Park District began with which six parks around the city? Which of these famous Washingtons does NOT have a Chicago park named for them? Which of these famous Jacksons does NOT have a Chicago park named for them? Which of these parks has NOT hosted a major music festival in the 21st century? McGuane Park used to be named Mark White Square. Garfield Park used to be named Central Park. Millennium Park used to be named Daley Park. Tobey Prinz Beach used to be named Pratt Beach. Lincoln Park used to be named Lake Park. Martin Luther King, Jr. was struck by a thrown rock in which park while marching for fair housing practices? The 1966 Freedom Rally led by Dr. Martin Luther King, Jr. In 1959, the Chicago Park District and the City of Chicago transferred management of a number of functions between them. Which did NOT transfer? The Park District transferred management of the boulevard system to the City. The City transferred management of over 250 playgrounds, small parks and beaches to the Park District. The City transferred its animal control department to the Park District. The Park District transferred its police department to the City. J. Frank Foster, the superintendent of the South Park Commission, developed the idea for a new kind of park. Rather than the large, vast strolling grounds of the elite, he conceived of smaller, neighborhood parks for working-class citizens who lived nearby that would provide services not previously available such as playgrounds for children, swimming pools and a Chicago innovation: the fieldhouse, which in turn housed library branches, rooms where people could take art, craft and English classes, and space to provide health care. Which park was the first of this new kind of park? What was the original purpose for the buildings that now house the North Park Village Nature Center and Theater on the Lake?